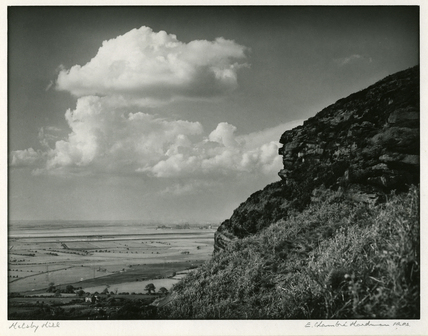 Photograph of Helsby Hill, Cheshire. The jagged rock face, in the foreground to the right, is the focus of the composition. A small farmstead is visible from the top of the hill and is in the foreground with patchwork fields and a power station in the distance. The clouds detract considerably from the landscape as they are very dense and command the attention of the viewer. This image of Helsby Hill was used to illustrate a newspaper article, captioned £1,000 appeal to save Helsby Hill. Liverpool Daily Post July 29th 1946.